For Nora the painful memory of being jilted on her wedding day weighs heavily on her mind but once her ex fiancée Joe, played by John Dumelo offers up his explanations as to why he jilted her, she can’t help but to accept that circumstances out of his control caused that situation. Is it possible that she can be in love with two men? John Dumelo looks like he has put on a bit of weight. I’m glad to see that he looks good with it, unlike others who shall remain nameless. The hot chocolate is not melting at all. His role was minor and did not make too much of an impression so no comment on his acting. The love connection – romance storyline between Nora and Ben was not properly developed. One minute we see the two just meeting and Nora is not sure about Ben. All of a sudden they are madly in love. We see her professing her love for him to her friend Agatha and defending him. It’s too quick, we don’t even see it happen. There is no build up. Two wonderful actors cast in the lead roles and the movie doesn’t even work. I can see how it could have though. Some scenes in the movie were just not believable. In one scene Ben is taking Nora and her friend Agatha out and the car breaks down. Agatha’s reaction is waaaaaay over the top. I’d blame that on the direction as opposed to Uche Elendu. She is screaming about the shame of it all and refusing to get back in the car, all over nothing. It seemed all a bit ridiculous to me. She played her role well but the character just did not fit in anywhere. Bizarre. In another scene we see Tony (played by Nuhu) come around and Nora looks really nervous. This did not make sense to me as he was not really part of the love triangle. Yes he claimed to want to marry her but she had already categorically told him that she was not interested, so it was not like she was reciprocating so why the nervous look? In this came scene Jo and Ben also turns up and they have a big confrontation during which Nora shouts at them to leave, and they all do without even protesting. This did not ring true for me either. I was really looking forward to an Nse Ikpi Etim and a Yemi Blaq pairing as I both hold them in high regard, and after the RUBBISH that was Blue Blood I hoped for better, much much better. Alas it was not meant to be. Again Nse was cast wrongly. The chick looks at least 33. How is she going to be cast as a student AGAIN? Naaaa! Not believable at all. Even her whole demeanour has a deep maturity about it. Someone like Mona Lisa Chinda looks older as well but she can pull off younger roles better. Nse is just not working for me in these young chick roles. Check this out; Uche Ebere was playing the role of Nse’s mother. What in the…? I’m not buying that one at all either. This age miscasting issue in Nollywood no be small thing o. Am I the only one who thinks Nse does not look like someone in their late teens or early twenties? I just don’t get why they keep on doing it. Even in Guilty Pleasures they had all Nse’s friends looking at least a whole decade younger than her. It was just strange. Do people on set not open their mouths and say something when things are so visibly wrong? Up until Part 3 the movie was not too bad, some of it was pretty unbelievable but the story maintained some sort of consistency. Part 3 (titled FINAL 24th JULY) is where it all went pitifully wrong. The story changed dramatically and there was a lot of focus on Julie, played by Uche Jombo. Again, totally BIZARRE. There needed to be linking back to the original story to keep it relevant. Part 3 was very very boring. In fact I fell asleep twice. It was too disjointed and far removed from the original story. The story morphed into something else until the end when we see Nora come back on the scene where she rises from the dead at the hands of Ben. I found it all very ridiculous. Why was Julie so horrible to the Janet character? The movie ended and I still didn’t understand what that was all about. In fact why was Julie in the movie at all? I felt that by the end there were still untied ends. This was not a good movie at all. Nse looked too old to be cast as a student (they need to stop that mess) Yemi Blaq was not doing it for me. Also i've had it with nollywood movies always churning out this i'm rich but want to act poor so she'll love me for me story line. Thats just rubbish cos nobody does that especially in Nigeria where people want to let you know what they are worth. So she had to die to figure out who's the right man for her – Go figure! Its not that deep people, please make it more believable. What's with the father asking all 3 men to come marry her on 24th July? Bi-polar father??? Nollywood forever, i think you've been very generous with the 42%, i'd give it 29%, not worth anyone's trouble if you ask me. Hmm I thought it was marginally better than Blue Blood (40%) and at least watchable until part 3. Nse needs to to be playing a student EVER AGAIN. I agree with you abut the believability factor. It was all messed up! Congrats on your new website, really well organized. I'll watch out for this but won't be holding my breath. Movies more than 2 parts are not my favorite. Thank you Myne. Yeah its got 3 parts. I'd say save your money! Trust it isnt great… at all! hey nolly…i wanted 2 watch dis movie until i saw u give it a 42%. i also appreciate wat d oda lady said abt movies longer dan 2parts, they kinda tend 2 drag it out…i'm stil awaitin d new emem isong's productions…nollywood hustler n mortal attraction…dis yr has been a drag with my kinda movies…cheers!!! The problem is they csnnot usually maintain the movie for a whole 3 or 4 parts. Most times it falls off somewhere because there is simply too much filler. There are exceptions to this rule of course… like PEACE TALK/ LAST FIGHT I loooooove that movie! Thanx Nolly I never knew that you review movie well like this bkoz I never visited your site as I thought its one of those jokes. thanx very much again as I thought I was the only one noticing most of these flops in nollywood movies. they are trying but they need to improve on most of their stories and the cast. Henceforth I will be a regular here but might not comment much sha! Thanks for coming by! Which jokes? Haba!!! I'm hoping something good is coming very soon… There are meant to be some very good ones coming up… Can't wait! LMAO @ "our" site! LOL thank you! I love Uche J. John Dumelo and Yemi Blaq. It's disappointing to hear the movie is not good. I really don't like when directors use good actors/actresses and the movie turns out so poor. It's just such a waste of talent. Hmm…John Dumelo putting on weight?….it's all that good living and eating….lol! Thanks Nolly for the review. I like them too, thats how I got fooled. 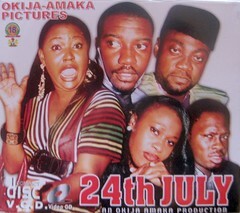 Ok wowww this is probably the crappiest nollywood movie i have seen in recent times 'R U Kidding Me?!!!!!!'. OMG It should have been called cringe movie. Honestly I cringed more times than I smiled. I agree with Nolly she looks to old to play student roles (don't get it twisted I think she's beautiful). When I saw Nse in Reloaded & Guilty Pleasures I assumed she was older than Ramsey. That being said she is a wonderful actress. The scene where Yemi was trying to lock his car so he could go get fuel it wasn't necessary for us to see him do everything from locking all doors to winding up the glass on each side.Thats just one of the many unnecessary scenes in this movie. Part 3 was ……….. pointless ( I love Uche Jumbo to bits and I think she's an awesome actress and I think she played her role well I just don't get why she would star in this movie. I forgot to mention Uche elendu's outfit for the wedding was horrible. The person in charge of wardrobe did a terrible job. Sorry what the hell was the writer of the script thinking are you serious??? She woke up from the Dead really!!!!! unbelievable!!! To think that this actually became a movie bothers me. After all the progress Nollywood is making this just takes us right back to square 1. Everything was wrong with this Movie except the actors. I love John,Nse, both Uche's and Yemi. Uche Elendu seems to be getting stuck to me. I think she's needs to play other roles she seems be stuck playing the bad girl in Uni who has the big hair, make up, high heels and itchy for money roles. I think she's good enough to play anything more variety plsss. That said I agree with Nolly's review completely. Yep Nse is definitely beautiful and I dont think this was the role for her. She was horribly miscast and this won't look good on her CV at all. Nevertheless I know she is a great actress and better is on its way… LOL I hope anyway! I liked Uche in this movie because she added some comedy whih is always necessary when a movie is not that good… It helps you get through it. well i dont think its that bad considering the presence and role of Uche Jumbo who kills it in any movie she is in. So fairly, i think this movie deserves 55%. Common guys. I liked the movie but this part of rising from dead was total rubbish, u mentioning age i never noticed it but its true. Nse's role was not good for someone on her age. Yes that part was quite comedic.